We can’t assume that the visions John recorded in the Book of Revelation follow a chronological order, events following one another in a neat line, moving from front to back as we read through the chapters. Scholars are divided on that, and since those debates are about two thousand years old we’re not going to settle them here. However, we can say with confidence that the fifth angel blows his trumpet and the bottomless pit opens before the battle of Armageddon, because the things that fly out have five months to torment the world and they won’t be active after Armageddon. So, what are those things? In my view, they can only be what the Bible tells us is confined to the abyss, the angels who sinned and “left their proper dwelling”—the Watchers, known to the Greeks and Romans as the Titans. 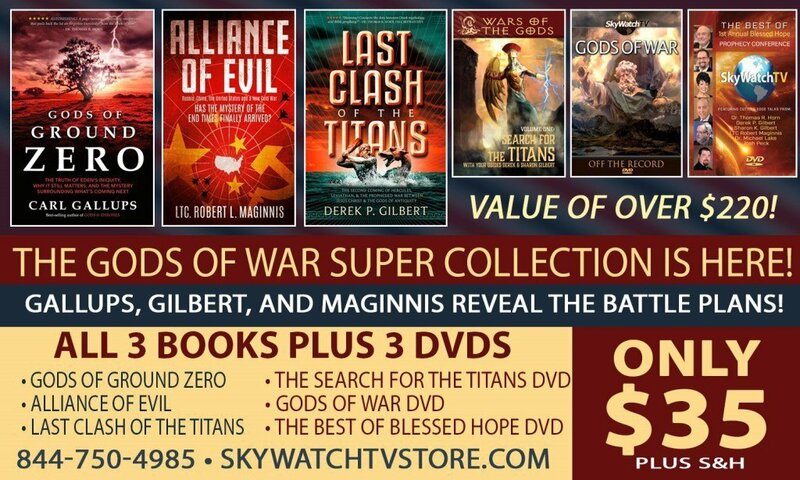 At some point after the release of the Watchers/Titans from the abyss, the armies of the world will gather for their date with destiny at Armageddon. Presumably, the released Watchers will be among the enemy horde. We can infer from Ezekiel 39 that another group of spirits eager for payback will be on the march with the army of Gog. Around the time of the Judges, and presumably for some time before the Exodus, the Amorite neighbors of the ancient Israelites practiced rituals that summoned the spirits of their venerated dead kings, the Rephaim, to sacrificial meals at the sanctuary of El. This was on Mount Hermon, El’s mount of assembly. Some scholars believe the purpose of that ritual gathering was the restore the Rephaim to life. The Rephaim were the heroes of the Golden Age ruled by Kronos, the meropes anthropoi of the Greek poets Homer and Hesiod. Since we’ve identified the Titans as the Watchers of the Bible, demigods of Greek mythology like Herakles and Perseus were, by definition, Nephilim. The ancient Greeks, Jews, and early Christians agreed on what happened to the spirits of the Rephaim/Nephilim/meropes anthropoi when they died: They became demons. Although the Greeks believed the daimones were kindly and helpful, Jews and early Christians had a different view. According to 1 Enoch, God forbid the spirits of the Nephilim to enter the usual places reserved for the mortal dead, so they were doomed to wander the earth causing trouble until the final judgment. Significantly, these spirits were described as “warriors of Baal” in the Rephaim texts from Ugarit. Parallels between Ezekiel 39 and Revelation 19, and between Ezekiel 27 and Revelation 18, identify the war of Gog and Magog as the battle of Armageddon. They are the same event. By comparing Isaiah 14 to Ezekiel 38 and 39, we see that the rallying point for the army of Gog isyarkete tsaphon, Mount Zaphon, the home of Baal’s palace. The mountain was also connected to the Hurrian, Hittite, and Greek storm-gods, and to the Greek god of chaos, Typhon. The conflict between Zeus and Typhon is clearly a parallel to the battle for divine kingship between Baal and Yamm, which in turn reflected the biblical conflict between Yahweh and the spirit of primordial chaos, Leviathan. Zaphon is today’s Jebel al-Aqra, an imposing mountain in Turkey on the Mediterranean coast just north of the border with Syria. This was also the mountain where the rebel from Eden, Lucifer, wanted to establish his mount of assembly to make himself “like the Most High.” Since Jesus specifically identified the storm-god Baal/Zeus as Satan, it’s logical to assume that this entity is the one who rebelled in Eden. Thus, the divine rebel from Eden was Baal, Zeus, and Satan. Thus we can identify Gog, the Antichrist of Revelation, as a servant of the storm-god/Satan. He will come from the “uttermost parts of the north,” which is Mount Zaphon. When Satan/Baal, the dragon of Revelation, sends Gog/Antichrist to war, his army will be comprised of demonic “warriors of Baal,” the spirits of the Rephaim/Nephilim. How do we know this? Because Canaanite texts also refer to the Rephaim spirits as “Travelers.” In context, the term means travel between one plane of existence and another—specifically, between the realm of the dead and the land of the living. That’s what makes Ezekiel 39 so fascinating: It is in the Valley of the Travelers that the army of Gog will fall. That place, the valley in the desert east of the Dead Sea, was known in the ancient world as a land of the dead. Several of the places the Israelites stopped during the Exodus had names associated with the underworld—Oboth (“Spirits of the Dead”) and Iye-Abarim (“Ruins of the Travelers”). While in this valley, the Israelites were lured into worshiping Baal-Peor (“Lord of the Opening [to the Underworld]”) and ate sacrifices to the dead. Think about that for a moment. The Antichrist will lead a demonic horde from the north against Israel. This will literally be an army of the dead—the ultimate zombie apocalypse. At the risk of putting too fine a point on the thesis of this book, let’s summarize one more time. I’ve been studying deities and demigods for the better part of the last two years, but you most likely haven’t. It’s entirely possible that I haven’t connected these names, dates, and places with enough skill to make the picture clear. The Greeks and Romans inherited much of their religion from older societies to the east. Scholars don’t know the exact order or routes of transmission, but by comparing the stories of their gods, and the type of worship and sacrifices they demanded, it’s clear that the the accounts of creation, flood, and former gods now confined to the underworld moved over the centuries from Sumer and Syria toward the north and west, where they eventually reached Greece, Rome, and the rest of the Mediterranean world. Names changed, but the broad outlines of their stories remained the same. This was a public relations effort by the Fallen to get out ahead of the Truth. The false religions of the rebel gods were ancient before Moses came down from Sinai with the Law. Several consistent themes emerged: The old gods, while confined to the netherworld, still had power to affect the living; spirits of the ancestors had to be appeased; and dead kings of old, the “men of renown,” could be summoned through rituals to bless current rulers. Sometimes, as with the cults of Molech, Kronos, and Baal Hammon, the sacrifice of children was required to satisfy the old gods. There were locations in and around the Holy Land connected to the dead, places where the spirits of the dead were believed to cross over, or travel, between the netherworld and the land of the living. The prophets, apostles, and Jesus Himself knew about this, which explains certain Bible verses related to the wilderness of Moab and Mount Hermon. In the time of the end, entities that we’ve been taught are imaginary are coming back to wage war against our Creator. The Greeks called them Titans, gods, demigods, and heroes; the Amorites, neighbors of the ancient Israelites, summoned them, sacrificed to them, and believed their kings were descended from them. The Bible calls them angels, Watchers, Nephilim, Rephaim, devils, demons—and Travelers. Our children and grandchildren are being taught that these entities are heroic characters in movies, graphic novels, and young adult fiction. Schools assign homework to ask students, “Could you be a demigod?” and to write essays explaining which immortal parent they’d choose if they could. Our society has been so convinced that the supernatural realm is unreal that most teachers and parents see no harm in this, even in Christian homes. We are called to be the firewall between this pagan propaganda and our families, but we’ve been told for so long that these entities are nonexistent, and their stories nothing more than classical literature, that we fail to see it for what is is—the greatest marketing campaign in history. That lie will explode in the last days. God has seen the end from the beginning, and we recognize now in the prophecies of the Bible that He has not only planned the defeat of these rebels, but He will do it in a way that shows to one and all the futility of their schemes. The Watchers are in Tartarus now, but they are loosed for five months at the end. With their demonic offspring and the rest of the rebel gods who still walk the earth, the angels who sinned will draw the kings of the earth into the greatest, most terrible battle the world has ever known: Armageddon—the Last Clash of the Titans.